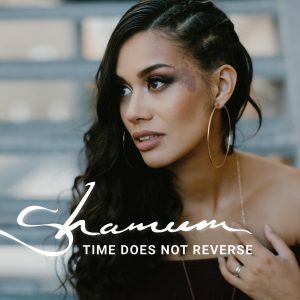 Shameem has announced the release of her new EP and fourth studio recording, Time Does Not Reverse. Time Does Not Reverse was recorded and co-produced with Rob Agostini (Rai Thistlethwaite, Tim & Jean) at Soundbaker Studios in Perth. A multi-skilled musician, Shameem wrote and co-produced the EP’s four tracks, playing keyboards and contributing to the drum programming, in addition to her stunning, gravity-defying vocals. A strong melodic sensibility and an unmistakable flavour of soul infuse the tight production, and provide the common threads between the contrasting songs. Ranging from moody to sunny, old school to neoteric, Shameem’s songs carry lyrical themes that span personal experiences, social commentary, and uplifting words of inspiration. In keeping with her philosophy of celebrating diversity, Shameem has confidently featured her strawberry facial birthmark in the EP’s cover art, as well as throughout the music video of the EP’s lead single, I Love You, But. http://www.shameemmusic.com/wp-content/uploads/2017/05/Shameem_logo_reversed_bi-line-383.png 0 0 shameem http://www.shameemmusic.com/wp-content/uploads/2017/05/Shameem_logo_reversed_bi-line-383.png shameem2017-07-28 09:00:442018-03-08 03:59:46New EP "Time Does Not Reverse"